Blown ribbed bowls (Zarte Rippenschale) with the ribbing ending at an arc under the mouth were decorated with a delicate filament of applied glass trail spiraling around the ribs. This relatively small group of vessels was circulated primarily in northern Italy, the Upper Adriatic, Switzerland and the Rhineland and maybe a Western product, date-able to the first century and possibly later. The bowl was made by mold blowing, followed by working free-hand to apply the trailing, expanded by free blowing and finished with working the rim. This type of vessel was also made without the trailing decoration. The examples of both types are shown from many museums and private collections. 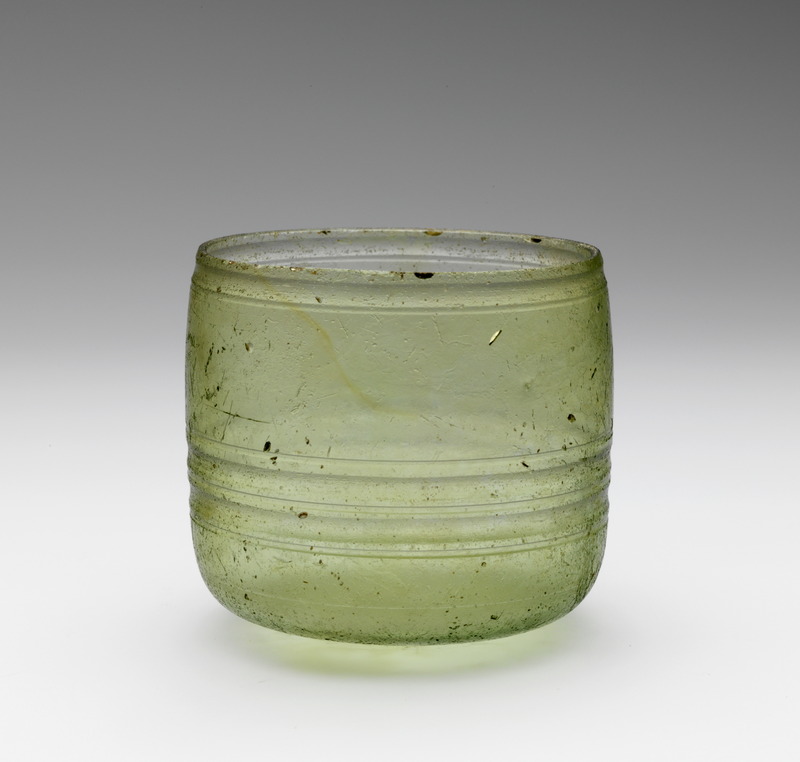 Description: Greenish free-blown footed beaker or ‘skyphos’ with straight walls, everted rim and hollow glass thread. Two handles in same color. Classification: Isings (1957) form 12. Description: Transparent light green glass with a few small air bubbles. Cylindrical body with almost straight sides. Rim knock off and polished. On the body engraved lines and cut groves. Round transition from sides to flat base. No pontil mark. Remarks: This cup is one of the most primitive forms of drinking vessel made at a very early date in pottery and metal, and imitated in glass (Isings, 1957). After the glass had been fully cooled down the glassmaker engraved the lines and cut the groves by making use of a turntable. Romeinse bekers en drinkglazen (H. van Rossum, 2011). Reference: Das naturfarbene sogenannte Blaugrüne Glas in Köln (Fremersdorf, 1958), Tafel 75, no. 201; Verres Romains (Ier – IIIme siècle) des Musées Curtius et du Verre à Liège (M. Vanderhoeven, 1961), no. 14 and no. 15; Kunstwerke der Antike, Antike Gläser, Sammlung Suter (Münzen und Medaillen AG Basel), Auktion 70, 14-11-1986, no. 15; La Verrerie Romaine du Musée Archéologique de Nîmes – 2e partie (M. Sternini, 1990), no. 538; Glass Throughout Time – History and Technique of Glassmaking from the Ancient World to the Present (R. Barovier Mentasti & others, 2003), no. VII, 24. Classification: Isings (1957) form 29. Description: Transparent bluish-green glass, nearly light bluish. Cylindrical body with almost straight sides, tapering downward. Flaring mouth. Rim knocked off and polished. 1,0 cm under the rim an engraved line, 1,5 cm downward a second engraved line and 0,5 cm lower a third engraved line. Flat underside. No pontil mark. Sides of thin glass, base very thick glass. Condition: Intact with some weathering and iridescence. Remarks: After the glass had been fully cooled down the glassmaker engraved the lines by making use of a turntable. The engraved lines are very fine and that’s why it is difficult to see on the picture. They are made as decoration. Exhibited: During the seventies and the eighties in the private museum of Anton Ackermann in Luzern. Reference: Rômische Kleinkunst – Sammlung Karl Löffler (P. La Baume & J.Salomonson, 1976), no. 97; Ancient Glass in the Israel Museum, The Eliahu Dobkin Collection and Other Gifts (Y. Israeli, 2003), no.164; Vom Luxusobjekt zum Gebrauchsgefäss – vorrömische und römische Gläser (M. Honroth, 2007), no. 176; Ancient Glass in National Museums Scotland (C. Lightfoot, 2007), no. 159 and no. 160; Catalogus 180 Charles Ede Ltd London, 2008), no. 62; Kunstwerke der Antike (Cahn Auktionen AG Basel), Auktion 7, 03-11-2012, no. 116. Roman Glass Guttrolf drawing from Dr. F. Fremersdorf and no. 1041 of the Corning Museum! Description: Transparent yellowish green glass, blown into a mold. This oddity was blown like a standard small bottle but instead of one opening this guttrolf has five small openings, one (in reality two very small openings in the form of a pair of in the opposite direction fixed triangles ►◄) at centre and four at every edge, separated by diaphragms. The marks of the tool which was used are still very good visible. This bottle is also a sprinkler by having a constriction and inner diaphragm at base of the neck and that is not only rare but in combination with the form of a guttrolf also strange. The upper part of the body, including the tubes covered with mold-blown pattern of ribs is rare too. Two handles applied on the shoulder, drawn up and attached to the edge of the rim forming a thumb-rest. The base is slightly indented with no pontil mark. Description: Transparent dark purple glass. Body with globular sides. Conical shoulder with bulging sides. Cylindrical neck with constriction at bottom. Rim folded outward, upward and inward. Flat base, slightly indented. No pontil mark. Remarks: These small, typical formed perfume bottles have been made in glass of many different colours, for example in bluish-green, grayisch-green, cobaltblue, purple, amber and colourless glass. 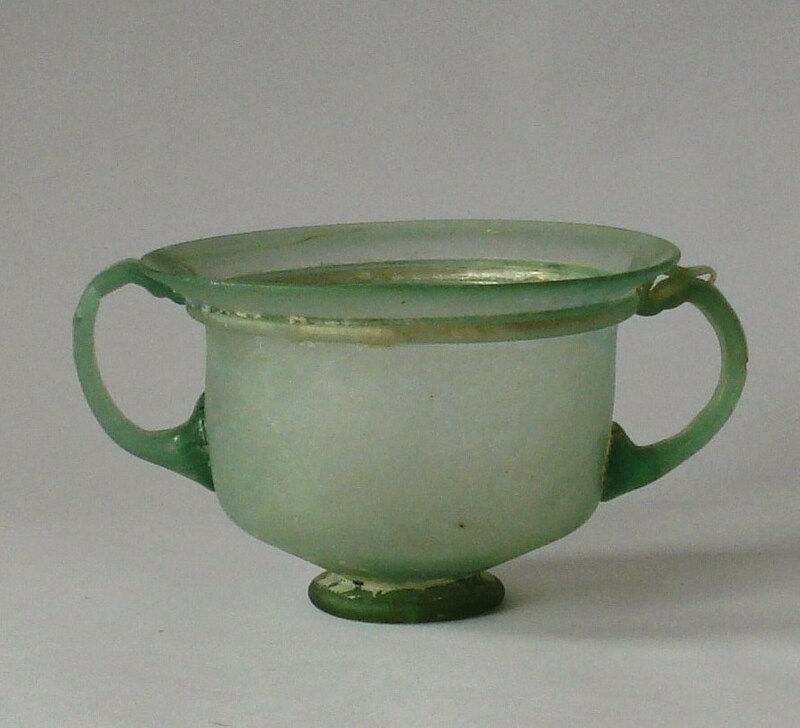 The basic colour of Roman glass is bluish-green. This has been caused because sand (the main element for making raw glass) has been polluted by iron oxide. By addition of some percents manganese oxide in the raw glass the colour changed into purple / aubergine. Reference: De Constable-Maxwell Collection of Ancient Glass – The Property of Mr. and Mrs. Andrew Constable-Maxwell (Sotheby, Parke Bernet, 1979), no. 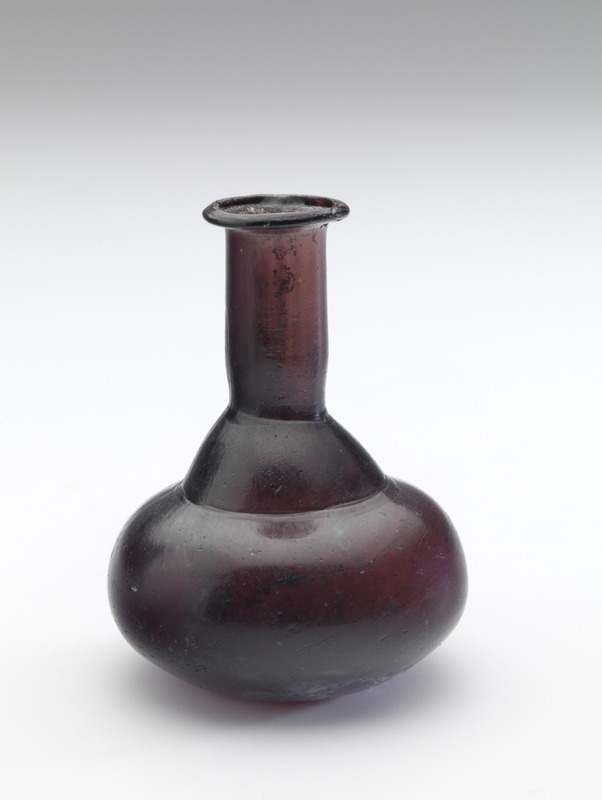 87; Ancient Glass – The Bomford Collection of Pre-Roman & Roman Glass on loan to the City of Bristol Museum & Art Gallery (N. Thomas, 1976), no. 55; Glas der Antike – Kestner-Museum Hannover (U. Liepmann, 1982), no. 63; Roman Glass in The Corning Museum of Glass – Vol. I (D. Whitehouse, 1997), no. 248; The Fascinating of Ancient Glass – Dolf Schut Collection (M. Newby & D. Schut, 1999), no. 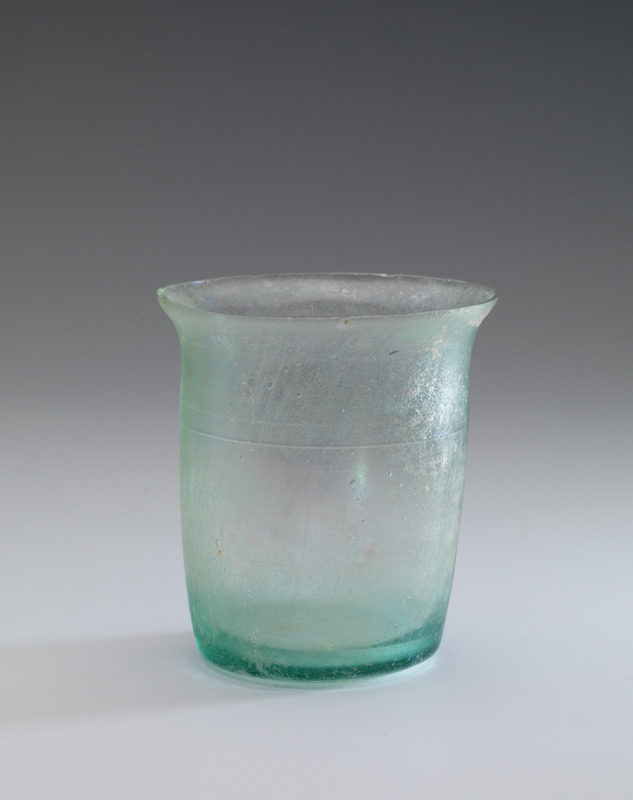 61; A collection of Ancient Glass 500 BC – 500 AD (P. Arts, 2000), no. 28; Vetri Antichi del Museo Archeologico di Udine (M. Buora, 2004), no. 33; Les Verres Antiques du Musée du Louvre II (V. Arveiller-Dulong & M-D. Nenna, 2005), no. 838; Vetri Antichi del Museo Archeologico Nazionale di Aquileia – Balsamari, olle e pissidi (L. Mandruzzato & A. Marcante, 2007), no. 224. 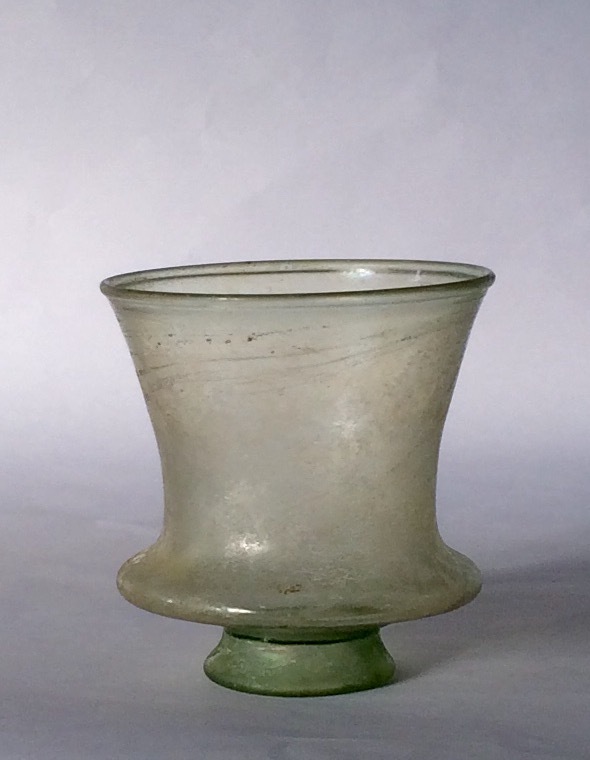 Description: Freeblown pale green bell-shaped beaker with applied foot. Rim plain and rounded, wall tapers, then splays to carination with slight overhang, below which it tapers sharply to bottom. No pontil mark. Ref. : Gallo-Roman Museum Tongres (Belgium); Kunstpalast Museum Dusseldorf (Germany); Rijksmuseum voor Oudheden, Leiden (Netherlands). * Cameo, ↑ 3.7cm, 37 BC, Römisch-Germanisches Museum Cologne (inv. Nr. 72,153). 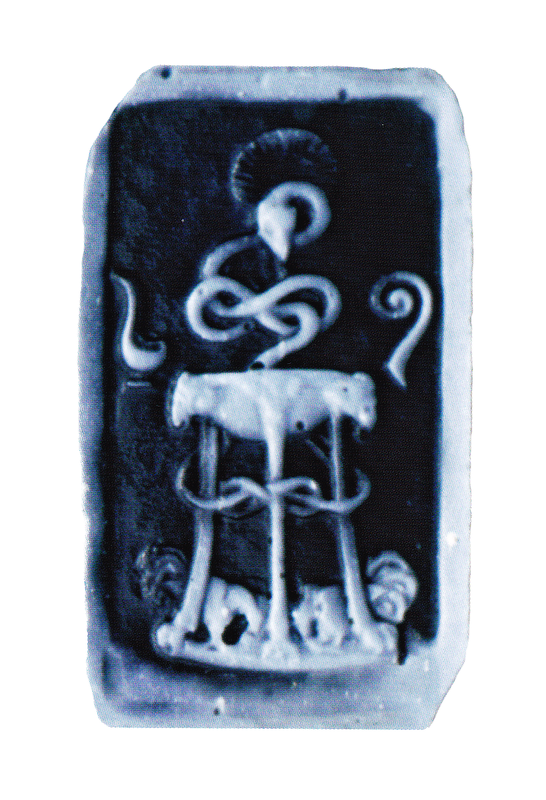 On this rectangular image of small proportion (↑ 3.7cm) are depicted: the laddle or simpulum, the snake with a nimbus**, the staff or Lituus, the tripod, with underneath the hens of the Sibyllic Oracle, representing the Quindecimviri Sacris Faciundis, the fifteen men who were allowed to interpret the Sibyllic Oracle and of which the emperor Augustus became a member in the year 37 BC, ten years before his inauguration. ** Nimbus: A shining cloud sometimes surrounding a deity when on earth. Ad1: The symbol of the snake, – coming up from it’s curled position, simplified as a cup with long handle ending as a cobra head -, is a reference to the birth of Augustus, who’s mother Atia did become pregnant from a snake during a sleep in the sanctuary of Apollo, near the Marcellus Theater built by Caesar. Augustus, ‘son of a snake’, is a personification of a better time to come. And indeed, the era of emperor Augustus (27BC-14AD) did bring about change and prosperity. Simon and Erika Zwierlein-Diehl as an collaboration of ideas to the book: Antike Glastopferei, Ein vergessenes Kapitel der Glasgeschichte. Ad 3.The size of the glass simpulum is rather small in comparison to bronze and silver versions, probably because of its religious and symbolic function. T.E. Haevernick suggests that the glass simpulum was used in connection to the Modiolus and that a concentration of production, though small in numbers, can be found in the adriatic area. 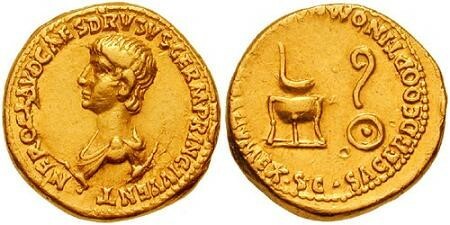 Concerning date of production, it might be placed in the First century, for the simpulum, as one of the (7) priestly implements belonging to the Pontifex Maximus appears on the coins of Augustus (27 B.C.–14 A.D.) Caligula (37-41 A.D) and Vespasianus (69-79 A.D.). Ad 4. Two different types of Simpula are being described by Höricht in I vetri Romani di Ercolano, 1995 as forma 17. Firstly the simpulum with trailed decoration around the outside of the cup, secondly the simpulum that does not carry any decoration as the version presented above. 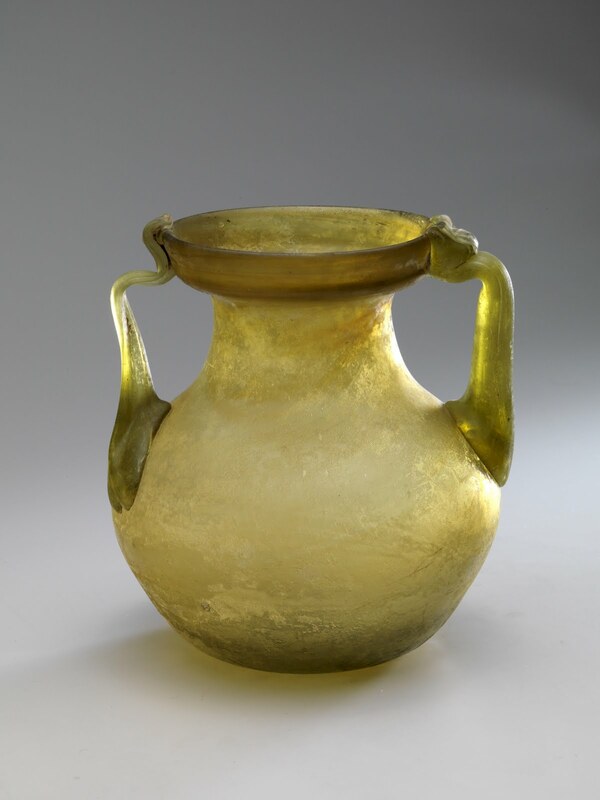 – A third version that carries a horizontally attached handle to the cup can be regarded as a so-called ‘Trulla’, a glass version of the legionairs bronze casserole, is in existence, but is out of context and of no meaning in this story. Ad 3. Several examples are known to be in existence. Höricht lists the examples from Herculaneum (Italian: Ercolano) and Pompeii of 9 in total, another example from Tipasa in Mauretanium, North Africa, a white example is listed in the St. Louis Art Museum, one from Vitadurum dated at the end of the first century AD, another coming from Samaria in the Collection of van Hans van Rossum, also dated towards the end of the century, and this one in The Augustinus Collection of Ancient glass in the Netherlands, most likely from after the eruption of Mt. Vesuvius. (79AD). Aureus of Nero (50-54). Reverse Four implements, the Simpulum, the Tripod, Lituus and Patera. Lituus, the staff, representing the Augures. Secespita, knife to slaughter animals and extract entrails. Aspergillum, to sprinkle holy water on the flesh. Simpulum, or simpuvium, a ladle to stirr or to transfer liquid for Libation, representing the Pontifices, who’s leader is the Pontifex Maximus: the Ceasar, i.e. Augustus. Praefericulum, ewer to pour liquids from, sometimes replaced by a Modiolus. Patera, round shallow dish to place entrails on; the symbol represents the Septemviri. Apex, in origin the olivetwig on the hat of the Flamen, a roman priest; later t the hat in totality was called the Apex of the Pontifex Maximus.